These golden flats by Kate Spade are the perfect way to celebrate San Francisco's sunny weather, and will hopefully help warm everyone up this morning! 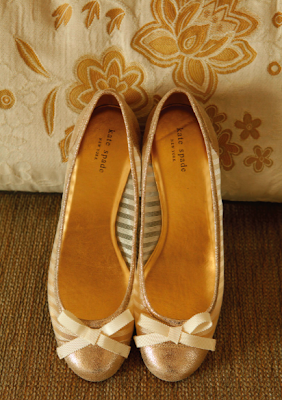 Would you wear a pair of ballet flats on your big day, or did you get some lift from a pair of high heels? Photo by Sweet Monday Photography. These are darling! (and are just furthering my love/obsession for everything Kate Spade...) But I do have to say, I'd probably want to be wearing some heels on my wedding day. oh, those are just perfect! I wore little heels on my big day.. but i would def wear a cute pair of ballet flats if i had to change it. sweet little magical flats to keep your toes sparkling all night long...perfection. ooh, those are adorable. I am a tough sell on metallic shoes (? ), but these are lovely. So pretty - and they look comfortable also! Ooooooh! They're wonderful! I'm a ballerina-addicted! Love to you,honey. Hope you're having a great week! I wore ballet shoes. So yes, I guess in a way I wore ballet flats. They have no arch support but I liked them anyway. I am short, so I'll take any extra height I can get. I do love these flats though! What is not to love about KS? I love your blog! I'm so happy I stumbled across it! There's something whimsically magical about golden shoes, particularly when Kate Spade is involved. I want these shoes! As far as I'm concerned, there's nothing better than gold shoes. I am always on the lookout for good ballet flats. These look entirely comfortable and are too sweet! Love Love Love the sweet stripes!!! These are stunning! I went for heels and I don't regret it! I'm a firm believer in heels for the ceremony and flats for the reception. And those are the perfect reception flats. I'd want heels, but perhaps would just get these anyway! These are my ideal shoe! Love them... They go with anything! love them! the color, the stripes inside... so pretty. the bows are so, so cute! i actually wore "foot jewelry" and was basically barefoot for the ceremony... then for the reception i wore flip flops. soooo of course i'd wear ballet flats! Wishing we had sunny weather here in NY today, but these adorable shoes are brightening my mood regardless! Thank you for your hard work to collect and organize, to share with you a lot about the fashion thing, and this is very useful to me.